How adequate are New York City’s services for elder abuse victims? This report has the answer. A “striking” array of gaps and barriers were identified…but equally important: respondents suggested an impressive number of solutions. 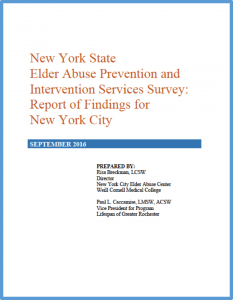 The purpose of the survey, to which 484 individuals across NY State responded (62 of whom reported serving NYC’s five boroughs), was to obtain granular feedback about the state of elder abuse services across multiple service systems. All counties except two, plus the Seneca nation, were represented. The majority of respondents reported on a county or regional, versus statewide, basis. Their function within their organizations varied, from front-line service providers to administrators. There’s both a need for elder abuse prevention and intervention services and for case finding. Details of both inadequate services and underused capacity were offered. Both the barriers to reporting abuse to law enforcement and the capability of law enforcement to respond adequately are problem areas. In NYC specifically, barriers to reporting to police could possibly reduce the number of elder abuse victims receiving compensation from the Office of Victim Services. There are numerous obstacles to elder abuse victims’ receiving crime victim compensation.